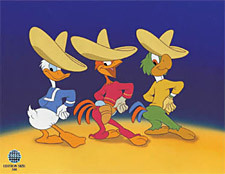 Featuring Donald Duck, Jose Carioca and Panchito, this musical moment is the first-ever limited edition sericel released by Disney Studios from this 1945 film, The Three Caballeros. This artwork recreates the musical moment featuring the singing and dancing amigos. Walt Disney was inspired to create this film after returning from a trip to South America undertaken at the request of the U.S. government. The result was a fun-filled musical tour of Latin America hosted by Donald Duck, who was the most popular Disney character at that time. This edition is a Limited Edition Sericel created by Disney artists. Specially mixed Disney colors were used to faithfully convey the richness of the scene.